I’m getting quite grouchy. The next time someone tells me about the new normal, I’m going to smack them one. I want the old normal back. I got a letter from our power company yesterday and apparently their heart goes out to me. The next time someone’s heart goes out to me, I’m going to smack them one too. Those words were good a month ago but now they make my fists clench. 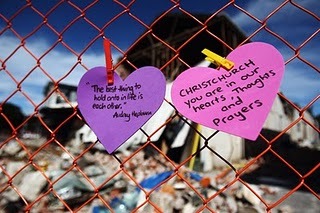 I heard on National Radio this morning that Christchurch needs to be prepared for a “tsunami of grief”. I’ve written that quote down and I’m going to use it in my defence when the next person tells me kia kaha and I chase them down the street so I can tackle them to the ground and smack them one. Strong is the very last thing I feel. In fact, the responsibilty of caring for someone else’s kids every day is doing my head in. I know the fastest route out of every corner of the school. If someone slams my classroom door, I’m halfway under the desk before I can draw breath. I can’t stop thinking about all those little Japanese schoolchildren in their classrooms by the sea. But then I’m in a supermarket in a town far away, trying to buy things that I can’t find in Christchurch anymore and I see a man, a weather-beaten farmer in a worn leather hat, and he’s wearing a tee shirt that says Aroha Christchurch, and I stand there with irrational tears running down my face and I don’t want to smack him at all. It must be so hard. I used to teach refugees and most of them had trauma issues – it was really hard not to be affected by it – every time a door slammed in the wind they would dive for cover too – there is a conditioned response and it’s hard to break it. Well I won’t say anything trite – thinking of you and hope that the trauma cycle passes soon. Thanks Mary Anna, I just need to keep remembering that it is a cycle and it will eventually pass. I just want to put my head in the sand for a bit though. Love the mug, your comment made me smile. Kia kaha means be strong, it’s actually a lovely thing to say normally but we’re just hearing it too much now, ya know? And I feel far from strong even on a good day. I guess you can only be so strong; we are only human. I have been going through something traumatic and scary for some years–something quite beyond my control, like earthquakes and aftershocks to a certain extent–sorry to be cryptic, but it’s that kind of thing. Anyway, recently I was able to take some action about it, and although it’s not over, and I don’t know when it will ever be over, I feel a bit better because I was able to make even minimal progress in overcoming the situation. I don’t think I was all that strong all those years, and I’m still not. Some things are just like that.